Metalformer E&E Manufacturing, Plymouth, MI, had an “ERP dilemma,” says the company’s chief financial officer Brian Swanson. During a 2010 review of its 2005-vintage ERP (enterprise resource planning) software solution, Swanson, along with Dan Liu, director of information technology, identified a host of concerns. Further, Swanson explains, the company’s previous ERP system lacked functionality with respect to lot traceability—a critical function for managing quality and process flow for one of its primary product lines—drawn metal fasteners. As a result, inventory management and accuracy suffered. 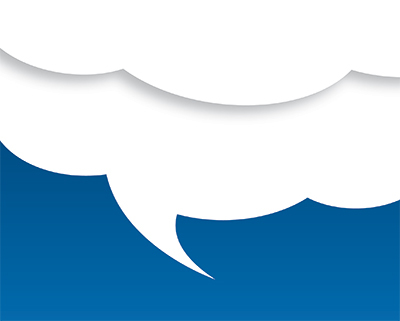 Faced with either re-implementing its existing ERP system and upgrading to the newest release, or investing in a cloud-based solution, Swanson, Liu and the rest of the E&E IT team opted to take its ERP to the cloud. Its plant in Athens, TN, went live with the Plex Online cloud-based ERP system in November 2011; the firm took its main plant in Plymouth live with Plex Online in March 2012. “We’ve experienced immediate cost savings as a result,” summarizes Swanson. An E&E press operator works at one of several Plex terminals throughout the plant. By logging into the ERP system, he can immediately learn of all of the jobs scheduled for the day and also note how much raw material is required, what’s available and where it’s stored. If required, the operator can call material handlers to ensure he has the materials needed to complete his work. E&E is a full-service metalformer supplying primarily automotive Tier One and Two customers with its proprietary lineup of fasteners, small- to midsized stampings and welded assemblies. It also offers prototype testing and design and engineering services. Its Plymouth campus of facilities, which totals 446,000 sq. ft., ships more than 1 million parts/day. Making recent headlines here: Beginning in September 2013, the plant will begin supplying light-weighted Humvee stamped and welded frame rails to one of the program’s prime suppliers. Explaining further why its aging ERP system had to either be upgraded or replaced, Swanson notes a few shortcomings that started to rear their ugly heads back in 2009 to 2010. “For starters, our ERP system at that time required a significant amount of manual effort to meet industry standards for lot traceability,” he says. “We need to track batches of parts—particularly fasteners stamped by the hundreds of thousands—forward (into assemblies) or backward (to the original coil). Precise lot traceability holds the key to cost-effective and timely quarantine of defective, or possibly defective, parts. 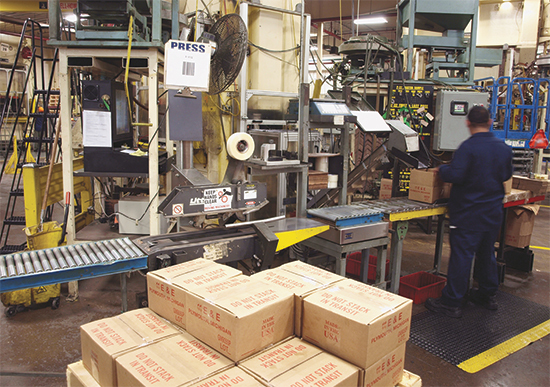 That type of improvement in inventory accountability allows E&E to better gauge and utilize manufacturing capacity, and to schedule its plants more efficiently. 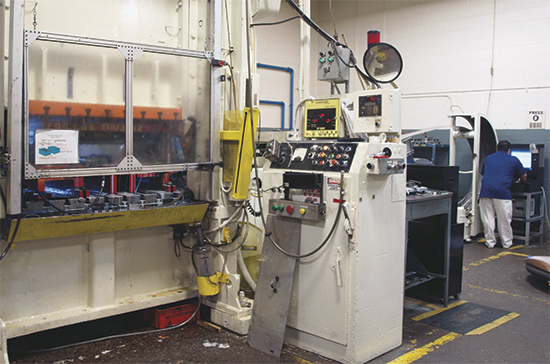 E&E experienced immediate and significant improvement in lot traceability and inventory tracking and accuracy by upgrading its ERP system, as witnessed at this cage-nut press line tasked with fastener stamping and assembly. The operator has a lot to do here, including managing the packaging operation and ensuring quantities are correct. Using the Plex terminal (far left) to log production data, he reports when each box has been packed. Once he has a full pallet, the system creates a master pallet label. The serial number from every box on the pallet then becomes associated with the master pallet’s serial number. E&E operators, adds Swanson, have taken ownership of the ERP system, viewing it as theirs and E&E’s and not a system that belongs to the IT or accounting departments. This real sense of ownership not only quickened implementation but also “has improved communication throughout the company, reinforced the need for disciplined business processes and helped managers at each level use data to make informed decisions,” says Swanson. Functional integration within Plex of business intelligence, quality management, supply-chain management (SCM), customer-relationship management (CRM) and other capabilities also has contributed mightily to E&E’s overall satisfaction with its new ERP solution. “Our annual cost to maintain the incumbent system exceeded that for the cloud-based solution by $50,000,” Swanson says, “due largely to ongoing software maintenance and required customization by an outside developer.” Swanson also notes all of the add-on solutions in addition to its legacy ERP system that were previously required to manage functions such as human-relations records, time and attendance, SCM and CRM. 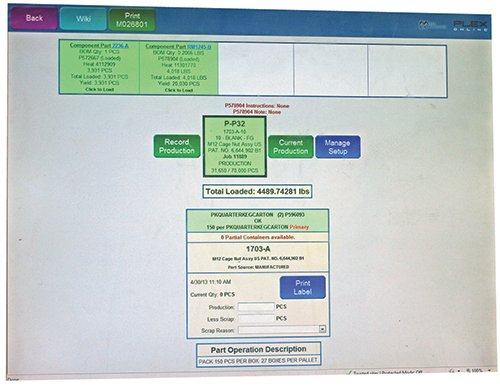 This Plex production-reporting screen lets the operator see how many parts have been placed in a container, how many parts can be stamped from the remaining coil of material and the number of fasteners remaining in the bowl feeders. He also can use data from the system to look ahead and prepare for when the coil will run out, and the location within the plant of additional coils. To initiate a work flow for purchasing, for example, an employee enters the requisition into Plex. Then the requisition is sent electronically to the next person or group of people responsible for the process, such as a purchasing agent. The impact of automating work flow on E&E’s business has been significant. Purchase orders, for example, that used to take 10 days or more to complete now are finalized in 2 days or less, on average. “We also plan to use the work-flow functionality to improve the APQP process. And, Plex includes an engineering-change rollout (ECR) system that uses work flow,” says Swanson. “Using e-mail notifications throughout the ECR process will enhance internal communications, and we’ll soon expand the Plex implementation to include customer and supplier PPAPs. Walking the plant, we spied Plex terminals scattered throughout, where machine operators can check the system and immediately learn of all of the jobs scheduled for the day. They also can see how much raw material and incoming subcomponents are required, and what’s available and where it’s stored. If required, the operators then can call material handlers to ensure they have the materials needed to complete their work. The enhanced material- and inventory-tracking capabilities and integrated labor reporting of Plex Online have, once again, made a significant and notable impact on the business. While E&E has grown by approximately 20 percent in the last few years, it has been able to consolidate positions and redeploy employees, reducing indirect labor costs. For their part, material handlers use scanners mounted to their hi-los for access into Plex. This allows them to process inventory moves in real time, simply by scanning the serial numbers of any containers moved. They also can merge and split containers at the shipping docks when needed, and immediately update inventory records within Plex. In production, E&E’s new ERP system has triggered an increase in manufacturing capacity, by helping to reduce job and tool changeover times. As a result, job start and end times have become more predictable.